Actually a tuber, the thin-skinned sunchoke looks like a small, knobby potato or ginger root. They vary in color from pale brown to white, red or purple. The sweet, crisp, white flesh has almost a sweetly fresh nutty taste with subtle hints of artichoke heart and salsify. Ivory and crunchy, the chewy texture is quite similar to jicama or a water chestnut. 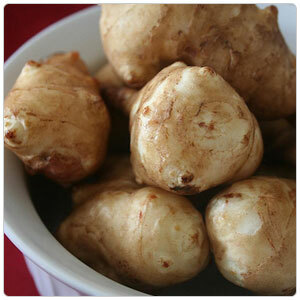 Roasted sunchokes play well with other roasted root vegetables; make great purees for use in soups and sauces. They can also be used raw in salads and crudités. There is much debate regarding the origin of the name for this tuber. It is safe to say that maybe nobody knows for certain where the name originated or why some refer to it as Sunchoke while others refer to it as Jerusalem artichoke. Some give credit to Will Kinney, an organic farmer in Vista, CA with devising the name "Sunchoke" in 1965. However, in 1950 Charles Heiser writes that a Swedish farmer created a hybrid of a Jerusalem artichoke and a common sunflower, to use as a sugar crop, and called it "Sunchoke". It is most likely that Native Americans, in Virginia, had already had a name for the plant and had been calling it "sun root" since the early 1900's.